At the age of fifteen, Frédéric Moutoussamy his first steps in photography, first as an assistant photographer in the studio H.Baranger. For four years, he teaches architectural shooting techniques, aerial and discovers the magic of the film laboratory. Around 1980 meetings bring Frédéric to dive into the world of media. For almost ten years, working for press groups. After these years, tired eye, the cover on the lens and body in the closet, Frederic decides to return to the calm of photo labs. 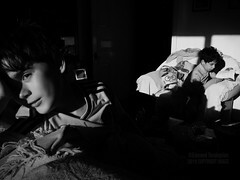 It is now for Frédéric give life to images of other photographers with his silver eye shooter. With the debut of digital photography, many silver laboratories are required to close. Some professional photographers are switching. This is the case of Frederick who embarks on IT. The camera always tidy and head out now darkrooms, Frederic gives up any activity related to the image, and unaware he enters a virtual production spiral that makes the sink. The meeting of Isabelle, his girlfriend changes her outlook on life. He finds pleasure to return the pencil to draw. He returned to photography and wanderlust. On the roads, Egypt, Turkey and Dehli up along the border of China and he spent several months in a Buddhist monastery, he indulges in events that guide. It takes time to photograph objects and portraits that inspire. With his life course, quieter and away from the capital, he wishes to take advantage of his experience to young designers. In 2012, with a friend Frédéric sets up an association “YETI CREATION”. It aims to promote and showcase projects of young designers in various fields such as film, photography and writing. A first trip to Cambodia and India has enabled Yeti Creations with the support of an NGO to set up exhibition in Lille and Brussels. In 2013, it provides for two projects: A report on the coal mines children (Meghalaya), a photographic workshop in Cambodia and personal work on bare in architecture. In 2014, he wants to set up workshops pictures. Today he is looking background and publishers for the realization of these projects.